Above: OUT OF CIRCULATION: The city is saddled with an expensive and undependable model of Circulator bus, a new study says. The Charm City Circulator has more troubles than a $11.6 million cumulative deficit and the legacy of a former division chief who pled guilty to taking bribes and money laundering. The electric buses purchased for $6 million to start the free downtown bus service are gas-guzzling mechanical failures. The city should get rid of the 13 buses – most of them already out of service – before it rebids the Charm City Circulator contract, transit consultant Louis Berger advises the Department of Transportation in a 200-page report reviewed by The Brew. The low-emission diesel hybrid buses, known as the DesignLine EcoSaver IV, were touted as the bus of the future when the city bought them in 2009, promising greatly reduced greenhouse gas emissions and good fuel economy. “The EcoSaver IV utilizes highly efficient electric motors that smoothly propel it throughout its complete range of acceleration,” DOT’s description, still on its website, states. The city initially wanted to buy 21 EcoSavers, but DesignLine was experiencing financial and manufacturing problems and could deliver only 13. In retrospect, that was a blessing. By February 2011, the city knew that the buses were not dependable. It leased five non-hybrid buses from Van Hool to help stabilize the fleet, and later added 12 new buses from Orion International in 2011 and 2012. Out of the original DesignLine buses, only four were still in regular service as of last summer, according to the Berger report. The others were removed from service, most between 2012 and last year, the report stated. The buses went out of service because their “sensitive electronics [are] not suited to heavy demands of near-constant operation, the jostling and jarring of city street conditions, and the extremes of heat and cold. . . DesignLine buses reportedly have trouble operating on hills, in hot weather, and in damp weather,” the report stated. In 2011, Veolia, the Circulator’s operator, sued DesignLine, seeking $2.2 million in damages, claiming the buses were defective and did not get promised mileage. Part of what led to the DesignLine buses’ failure was the company’s bankruptcy in 2013. Neither it nor another manufacturer can provide parts or service the extended warranty. The buses are apparently so problematic that Veolia (now named Transdev) has to employ a part-time electrical engineer to troubleshoot the electronic system, and buses that have ceased to operate have been cannibalized to service the others, the report said. And the four DesignLine buses that are running “are used sparingly because of reliability problems.” Maintenance costs are high – $1.86 per mile compared to 38 cents and 60 cents per mile for the other two bus types in the fleet – and are expected to increase as they age. Their fuel economy is likewise poor. DesignLine buses had a three-year average of fewer than 2 miles per gallon, according to the report. This contrasts to 3.02 and 3.6 miles per gallon for other bus models in the fleet. To make matters worse, because the DesignLine model was supposed to be fuel efficient, it has an unusually small fuel tank, which requires mid-day filling, adding to service disruptions. Charlotte’s Douglas International Airport recently auctioned off their DesignLine buses – bought around the same time as Baltimore bought its original Circulators – for between $3,000 and $4,000 each. “We wanted to cut our losses,” said the airport’s assistant aviation director. One reason the city has not auctioned off its DesignLines is because it is still paying for them, according to both the Department of Finance and the Louis Berger reports on the Circulator’s operations. Payments under the long-term finance plan will amount to $573,211 in both 2015 and 2016 – and, according to the Berger report, another $286,605 in 2017. As part of its $130,000 analysis for DOT, Berger found that “current routes are not being serviced reliably” due to bus shortages and the need to have buses in reserve. The report, which looked at four days of Circulator operation last summer, found that the system – which needs 19 buses to function optimally – was short of buses on each of the four days. On two days, only 17 of the 19 buses ran; on the other two, only 15 were operating. The Purple and Green routes had all of their buses (6 each) running only a quarter of the time. Based on current service needs, Berger says the Circulator would need at least two more new or leased buses to maintain current promised headways (10-20 minutes depending on the route) and to add “spare” buses as required. This calculation was done before the planned extension of the Purple Route and cancellation of the Banner Route later this year. The shortcomings of the DesignLine bus quickly became known in transit circles quickly. New York City Transit had planned on buying several hundred of the buses, but after a trial cancelled its order in 2010 and got a refund. 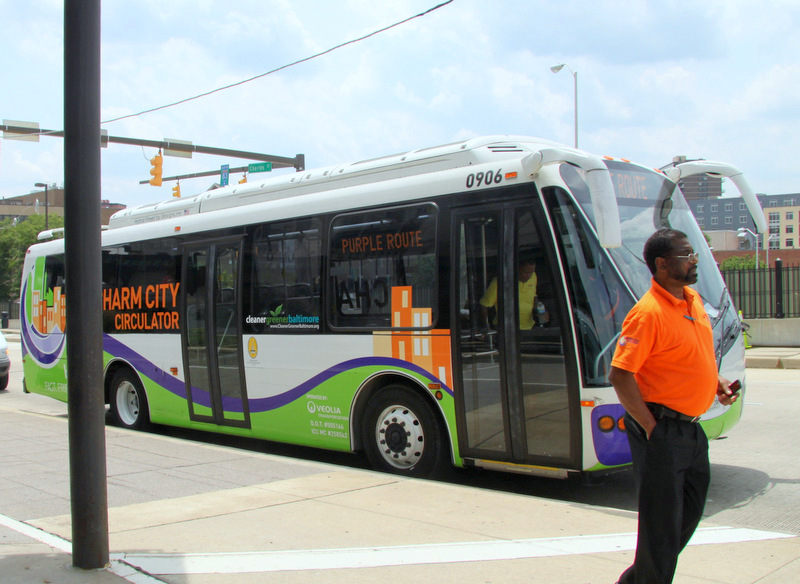 Whether Baltimore City had a trial arrangement or even considered returning the buses (which would have delayed the launch of the service) is not clear. 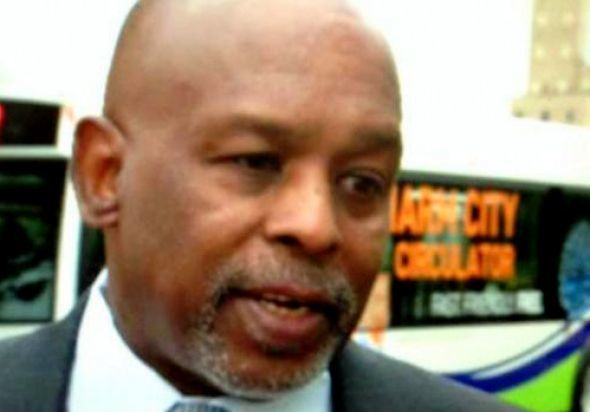 The director of the Charm City Circulator at the time, Barry S. Robinson, is no longer with the agency. He was indicted for bribery and money laundering last fall. He tried to sell city bus shelters to fund his retirement, according to the indictment, and agreed to accept cash payments to “write off” portions of Circulator advertisers’ bills. Robinson pled guilty in December on all charges and is scheduled to be sentenced in U.S. District Court later this month. Berger advised the city to replace the four operating DesignLine buses as soon as possible for several reasons, most notably to ensure a range of quality bidders on the next operators’ contract. The city recently extended Transdev’s contract for one year. The $12.4 million deal keeps the Circulator running only until July 2016. Berger’s report warned that potential bidders will examine the current fleet and maintenance records and see the low efficiency and declining performance of the DesignLine buses. Being saddled with four buses with “orphan technology” that only Transdev staff know how to fix – and no manufacturer to supply parts – would likely limit the number of bids or “create incentives for bidders to inflate costs,” the report advised. Whether the city is planning on following Berger’s advice is unknown. Mayor Stephanie Rawlings-Blake recently included $2.2 million in the 2016 city budget to replace buses for the popular free service. Details about how the funds will be spent have not been announced. An email request to DOT’s public relations staff asking for information was not answered.